The challenges of Alzheimer’s disease — the physical burdens, financial costs, emotional turmoil and family strife — can reduce our loved one to a “he” or a “she,” a person almost devoid of humanity. As caregivers, our lives revolve around the basics, like doctor’s appointments and dressing, feeding and cleaning up after our loved ones. Their life becomes our life; our life becomes theirs. But who are they now that this disease has taken over? And just as important, who are we? 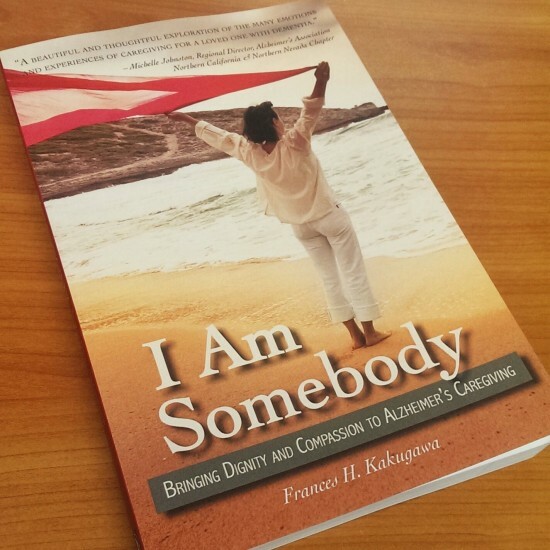 In “I Am Somebody: Bringing Dignity and Compassion to Alzheimer’s Caregiving,” dignity-in-caregiving advocate Frances H. Kakugawa presents a new vision of caregiving. “I Am Somebody” offers guidance in using poetry and journaling to become a more compassionate caregiver. It is a therapeutic tool providing advice and insights in the form of poems and journal entries from 12 individuals — men and women with a diverse range of cultural backgrounds, ages, faiths and education who have cared for mothers, fathers, wives and husbands — who have made this difficult journey. Kakugawa and her fellow caregivers paint a vivid picture of the caregiving journey and all of the attending struggles, triumphs and deepest fears. “I Am Somebody” gives voice to the caregiver experience, allowing unspoken feelings to be expressed and caregivers the space to explore what their loved ones might say, if they could. Caregivers will find this assemblage of experiences resonant, while those who are more peripherally involved, such as non-caregiving family members and medical professionals, will gain new insight into the daily caregiving experience. Kakugawa opens each chapter with advice directed toward both caregivers and those in their support circle. “I Am Somebody” is Kakugawa’s fourth book on caregiving. Her previous works are Watermark Publishing titles “Mosaic Moon: Caregiving Through Poetry” and “Wordsworth Dances the Waltz,” a children’s book about families living with grandparents with Alzheimer’s and other dementia-related illnesses (a Mom’s Choice Award Silver recipient), and “Breaking the Silence: A Caregiver’s Voice” from Willow Valley Press of California. The award-winning author of 12 books and “Dear Frances,” a monthly advice column for caregivers in The Hawaii Herald, Kakugawa conducts workshops and lectures nationwide. Through her writings, workshops, school visits, readings and speaking engagements, she helps others embrace caregiving and, through their writing, discover their own humanity.